Global events and cultural trends inevitably give each generation of UVA students an individual identity, but no matter the era, students find their time on Grounds defined by common values and traditions that create a shared experience. 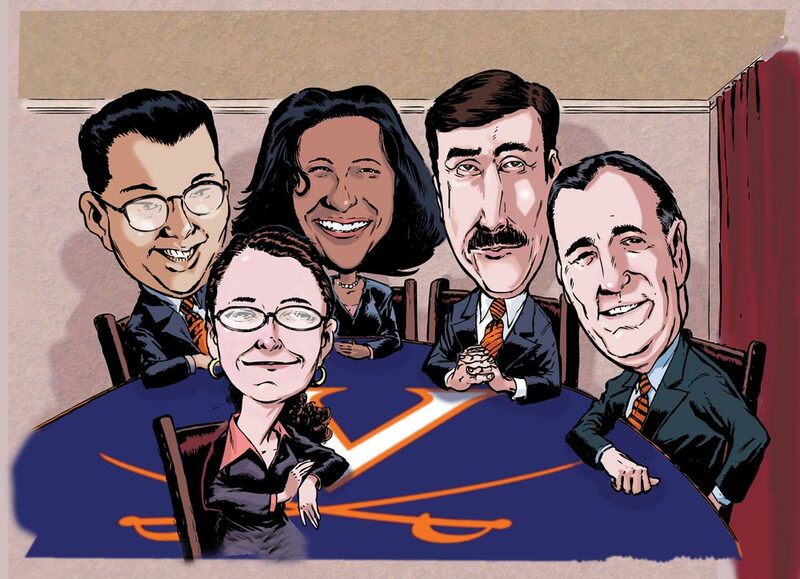 To articulate the ingredients of UVA’s “special sauce,” members of the Board of Visitors invited five alumni from four decades to participate in a panel discussion in the Rotunda Dome Room. The panelists shared the differences as well as the similarities among their experiences at the University and beyond, illustrating how UVA provides a special blend of academics, extracurricular activities and self-determination that has shaped their lives. Al Park (Col ’99) earned a bachelor’s degree in government and sociology. While at UVA, Park was elected president of the Inter-Fraternity Council. He is currently the director of CapTech, a technology consulting firm, and is based in Washington, D.C.
Meghan Sullivan (Col ’05) earned a bachelor’s degree in philosophy as well as government and foreign affairs. While a student, Sullivan was elected chair of the Honor Committee. She earned her Ph.D. in philosophy from Rutgers University this spring, and this fall she’ll be an assistant professor of philosophy at Notre Dame. Cheryl Mills (Col ’87) earned a bachelor’s degree in philosophy, religion and economics. While a student, Mills was selected to serve as a co-chair of the Resident Staff Program. She currently serves as counselor and chief of staff in the U.S. Department of State. Larry Sabato (Col ’74) earned his bachelor’s degree in the honors program in government and foreign affairs. Sabato was elected president of Student Council while a student at UVA. He founded the UVA Center for Politics and is the Robert Kent Gooch Professor of Politics. Tim Ingrassia (Col ’86) earned an interdisciplinary bachelor’s degree as part of the Echols Scholar program. While a student, Ingrassia was selected as the first undergraduate student member of the Board of Visitors. He is currently head of North American Mergers and Acquisitions for Goldman Sachs in New York City. What defines your student experience? Leave a comment below.